The proposed emission cuts by individual nations under the Paris Agreement are voluntary (unilateral), without an enforceable compliance mechanism. In this sense, the Agreement cannot be considered “binding” on signatories. The voluntary national emission reduction commitments are not critically analysed in the Agreement , but noted to be inadequate for limiting warming to 2°C. 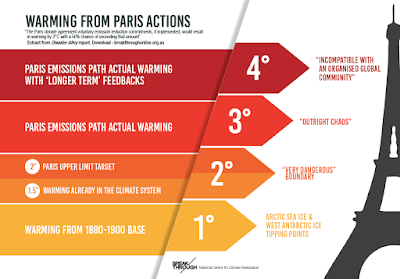 The Paris voluntary national commitments would result in emissions in 2030 being higher than in 2015 and are consistent with a 3°C warming path, and significantly higher if the warming impacts of carbon-cycle feedbacks are considered. Unless dramatically improved upon, the present commitments exclude the attainment of either the 1.5°C or 2°C targets this century without wholly unrealistic assumptions about negative emissions. 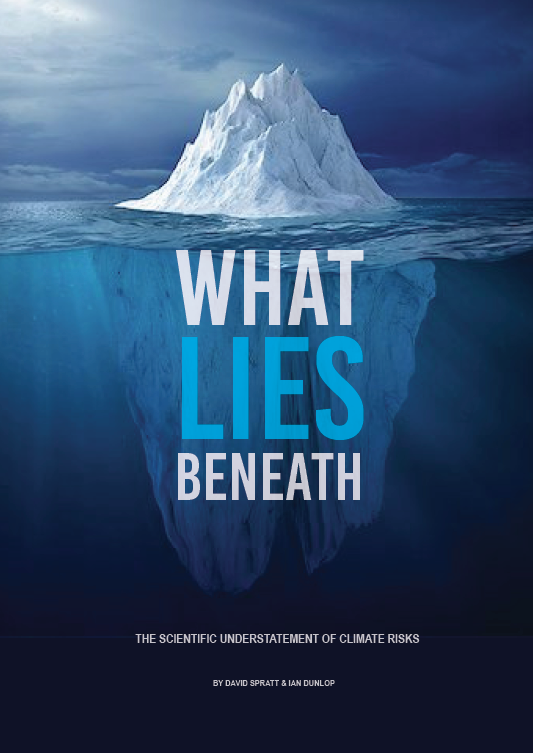 The UNFCCC primary goal is to “stabilize greenhouse gas concentrations in the atmosphere at a level that would prevent dangerous anthropogenic interference with the climate system". But what is “dangerous”? 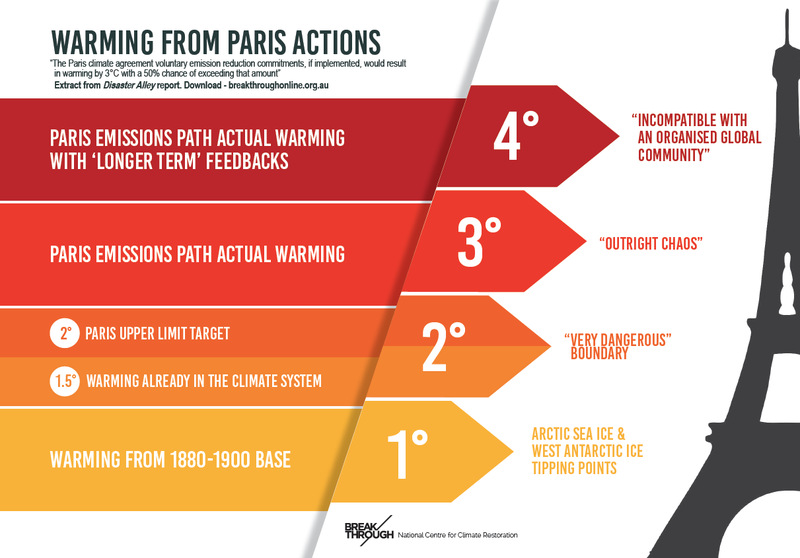 Traditionally, policymakers have focused on the 2°C target, but the Paris Agreement emphasises “holding the increase in the global average temperature to well below 2°C above pre-industrial levels and pursuing efforts to limit the temperature increase to 1.5°C”. With the experience of global warming impacts so far, scientists have distinguished between "dangerous" (1-2°C band) and “extremely dangerous" (above 2°C) climate warming. 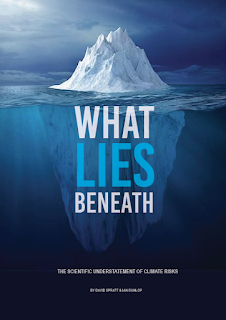 But we now have evidence that significant tipping points –– for example, summer sea-ice free Arctic conditions, the loss of West Antarctic glaciers and a multi-metre sea-level rise –– have very likely been passed at less than 1°C of warming. As well, evidence is accumulating that around the current level of warming more elements of the system may be heading towards tipping points or experiencing qualitative change. These include the slowing of the major ocean current known as the Atlantic conveyor, likely as a result of climate change; accelerating ice-mass loss from Greenland; declining carbon efficiency of the Amazon forests and other sinks; and the vulnerability of Arctic permafrost stores. Warming of 1.5°C would set sea-level rises in train sufficient to challenge significant components of human civilisation, besides reducing the world’s coral ecosystems to remnant structures. In other words, climate change is already dangerous, but the UNFCCC processes have not acknowledged this reality, proposing higher warming targets as policy goals. Nor has the IPCC process, with its lags in its publication process, and a “burning embers” representation of the risks that again looks too conservative. An expert panel recently concluded that warming would need to be limited to 1.2°C to save the Great Barrier Reef.80 That is probably too optimistic, but with a warming trend of 1.05–1.1°C and 2016 global average warming above 1.2°C, it also demonstrates that climate change is already dangerous. The question as to what would be safe for the protection of people and other species is not addressed by policymakers. If climate change is already dangerous, then by setting the 1.5°C and 2°C targets, the UNFCCC process has abandoned the goal of preventing “dangerous anthropogenic influence with the climate system”. The UNFCCC key goals ”to ensure that food production is not threatened" and achieving "a time-frame sufficient to allow ecosystems to adapt naturally to climate change" have been discarded for all practical purposes. Food production is already threatened by rising sea levels and inundation, shifting rainfall patterns and desertification, and extreme heatwave and wildfire episodes. Such events became a driver of the “Arab Spring” and a threat multiplier in the Syrian conflict and in Darfur. Ecosystems including coral reefs, mangroves and kelp forests in Australia are degrading fast as the world's sixth mass extinction gathers pace. Major ecosystems are now severely degraded and climate policymakers have no realistic agreement to save or restore them, from the Arctic to the Amazon, from the Great Barrier Reef to the Sahel. The Paris Agreement recognised the “fundamental priority of safeguarding food security” (note the change from the original goal to “ensure” food production is not threatened). The Paris Agreement made no references to time-frames sufficient to allow ecosystems to adapt naturally to climate change, suggesting this goal has been (literally) dropped. Because climate change is already dangerous, a reframing of the objective for international policymaking is required. A similar failure is occurring in our understanding of and response to climate change today. Such failures are manifested in two ways in climate policy. At the political, bureaucratic and business levels in the underplaying of the high-end risks and in failing to recognise that the existential risks of climate change is totally different from other risk categories. And at the research level, as embodied in IPCC reports, in underestimating climate change impacts, along with an under-emphasis on, and poor communication of, the high-end risks. The IPCC reports have not provided a sufficient evidentiary base to answer a key question for normative policymaking: what would be safe? As noted previously, IPCC processes paid little attention to less than 2°C scenarios until prompted to do so by the political sector. Climate policymaking at all levels of government use the reports of the IPCC as the primary physical science basis. The failure of the IPCC to report in a balanced manner the full range of risks and to fully account for high-end outcomes leaves policymakers ill-informed and undermines the capacity of governments and communities to make the correct decisions to protect their well-being, or indeed to protect human civilisation as a whole, in the face of existential risks. A reframing of the scientific research within an existential risk-management framework is now urgently required, if policymaking is to be soundly based.